These beautiful raised relief maps are ideal for hanging on the wall in a home entrance hall or lounge where guests can gather round. They're great conversation starters. The same goes for office foyers, and for hotels and guest houses. Visitors can study the countryside and plan their days out while looking at a three-dimensional representation of the area. A 3d map on the wall as people enter your home, or in a prominent place on a lounge wall, can give you long and interesting conversations with your guests. If they know the Lake District or the Yokshire Dales, depending on which map you have hanging, they'll no doubt start pointing out the valleys where they've rented cottages, mountains they've climbed, or lakes and tarns in which they've swum or fished. Yes, a raised relief map is a tremendous ice-breaker and conversation starter. And if your friend have never been to these magnificent areas of the country then here's the opportunity to persuade them to plan a visit. Earlier this year my wife and I were staying in a Bed & Breakfast hotel in Yorkshire. Immediately as we walked in through the front door we saw their wall map of the Yorkshire Dales. It was a raised relief map of the type shown here. I asked the propietress whether it got a lot of comments. She confirmed that it did and went on to explain how they were able to gather groups of people around the map and give them a mini-lecture on the layout of the area and how the various dales and their rivers relate to one another. She said that it was extremely helpful to their visitors as they set about planning their days out. Hoteliers in the Lake District find the same. So what's the point of the previous paragraph? 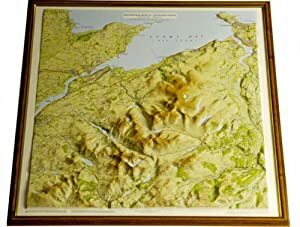 It is that although these deep relief 3d maps are excellent as wall decoration in an home, where guests will often stand and talk about their favourite mountain or valley, in an hotel or guest house they are not only a matter of interest but contribute to the quality service provided by the owner. 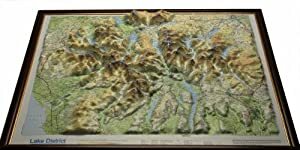 Wouldn't it be good if every guest house owner in the Yorkshire Dales, the Lake District and Snowdonia had a local raised relief map on the wall for next season. In the school room there are other opportunities. Is a trip to Snowdonia coming up soon? Then here is the ideal pre-trip educational tool. Equally a raised relief map with its 3-dimensional representation of the landscape is perfect for geography and geology lessons. It can either be hung on the wall or installed horizontally. Unframed versions are available.